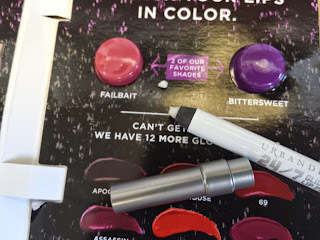 Urban Decay 24/7 Glide On Lip Pencil - Ozone (0.8g sample value: $13.30) - At first I was a little bummed because I saw a cardboard sample. Then I opened it and....yay! It wasn't a boring lip gloss or foundation sample but a lip pencil, and a very nice sized one too. 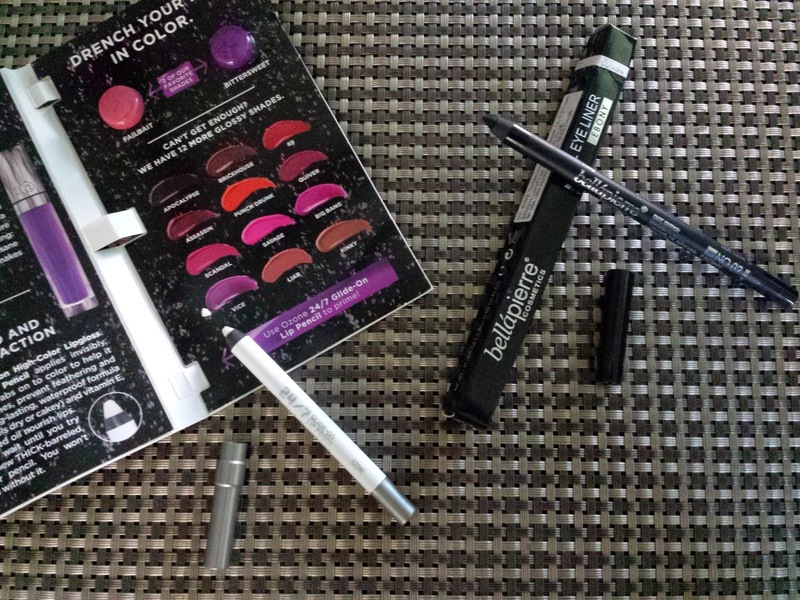 I think what I like most is that the Ozone one is colorless so it's appropriate for all lipstick/lip gloss shades. It also contains vitamin E, jojoba oil, and cottonseed oil so it's moisturizing. Or it should be anyway. It did feel moisturizing to the touch. I know so because when it arrived, the tip was broken and when I picked up the broken piece it felt squishy. You know, like the dried up lotion ball on the pump of a bottle. But when I actually tried applying it, it didn't glide on smoothly at all and in fact nothing even transferred to my lips. They were just as dry after as they were before application. Bummerz. In addition to the lip pencil were two Revolution High-Color Lipgloss samples in Failbait (peony pink) and Bittersweet (lilac purple). If you're into bold colors these be for you, but they were both waaay too bright for me to wear anywhere past my bathroom door. Bellapierre Waterproof Gel Eyeliner - Ebony (0.8g full size value: $15) - I'm a fan of black eyeliners and will always be, so I'm not disappointed in getting this. But I just have so many and I collect them faster than I can use them. I'm still on the search for the perfect fine-tipped eye pencil that goes on smooth and won't budge; they all claim to be smudgeproof but maybe I have oily eyes or something because they always end up coming off within a couple hours. Maybe I should practice using liquid liners, at least I know those won't budge. Anyone got any tips on how to have a steady hand? Not Your Mother's Deja Vu Do Style Extender (1oz sample value: $2.25) - Do you believe in magic? How about a cream that controls frizz and keeps your hair clean for days by repelling dirt and oil? All while adding body and flexible hold. So I guess it's also like a creamy mousse? I like fruity scents, and while this has an apple berry scent it's a bit strong for me. I think it's because there's a chemical smell in it that turns me off. St. Tropez One Night Only Instant Glow Body Lotion (1.69oz sample value: $6 $3) - If you want an instant tan that will wash off the next time you shower, this is your answer. And it's on sale for half off! I shouldn't have to use self-tanners very often since it's pretty sunny here all year round, but as I find myself locked indoors 90% of the time, I'm pretty pasty compared to most of the other folks. Not to mention that in the rare occasion I do catch a real tan, it fades within a week. What can I say, my skin loves to regenerate as quickly as possible so...thanks I guess? I want to be nicely tanned for my upcoming wedding so I'm on the hunt for the perfect tanner that won't stain my dress. One Night Only lotion is a self-tanner will last for, well, one night. Or until you shower. Or get rained on. The tanning effect should be instant since you're basically rubbing color on yourself. I used this over the weekend and saw absolutely no difference. I wasn't too surprised though. Even self-tanners that should last a week last barely a day on me. It Cosmetics Your Skin But Better CC+ Cream with SPF 50+ (4ml sample value: $4.75) - I don't use CC creams, but I opened this because it came in a nice shiny box. I'm a huge sucker for pretty packaging. Like other CC/DD/EE/FF/ZZ creams etc, this one is a multi-tasker - moisturizer, concealer, brightener, and sunscreen. It's oozing with all kinds of good stuff like niacin, hyaluronic acid, peptides, and vitamins A, B, C and E. I think I'll use this as an eye brightener for when I only get a couple hours of sleep and wake up with uglies under my eyes. Well, I suppose my hunches were somewhat correct. 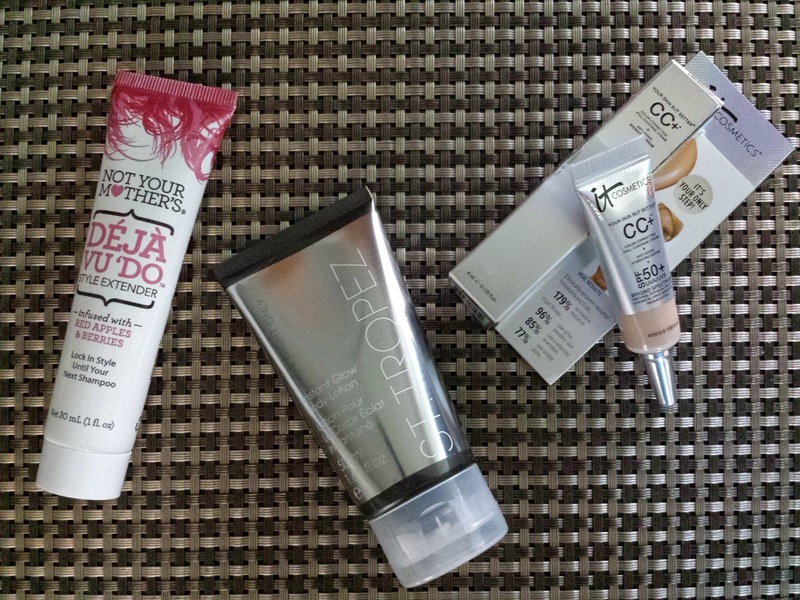 We have a UK-based brand in here (St. Tropez) as well as multi-taskers (CC cream & hair cream). Unfortunately, 3/5 items were misses. I'm disappointed in the lip pencil and self-tanner, and the hair cream scent makes my head hurt. I'll probably end up giving away the eyeliner since I have a million blacks at home, so the only thing I'll actually use is the CC cream. Looks like it's time to tweak my profile! As you can tell from this review, not every glam bag is a hit, but overall I still think Ipsy is worth it. 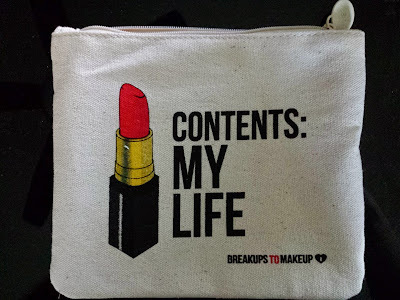 Makeup is freakin' expensive and the glam bag value is unreal. This month I got over $30 worth of stuff for less than $10. Sure, I kind of lost out this month since I'll only keeping one thing that's valued at less than I paid, but there have been months where I totally lucked out. 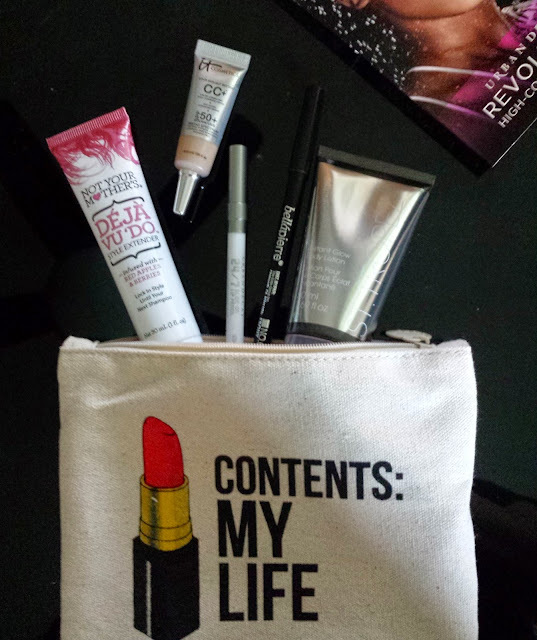 To get your own Ipsy glam bag, click here to get on the wait list. You won't be charged for your first bag until you get off the list (it usually takes several weeks, but you can skip the wait by posting to Facebook and having a friend subscribe from your link).